Please note: The numerous photos accompanying this article have been collected into an online photo gallery of NYC models in S. Convenient .pdf documents summarizing NYC locomotives, passenger and freight cars may be downloaded at the bottom of this article for your reference. If you’re a New York Central fan, there’s good news and bad news (well, not really bad). The good news is that a lot of the NYC’s locomotives and rolling stock have been manufactured in S scale, the one major exception being a lack of any NYC Pacific (4-6-2). The bad news is that most of the locos are no longer being manufactured. But there is more good news: the secondary market. Search eBay (Toys & Hobbies/Model RR, Trains/S Scale) on a regular basis. Top-quality brass and plastic steam and diesel locomotives appear on eBay quite often. 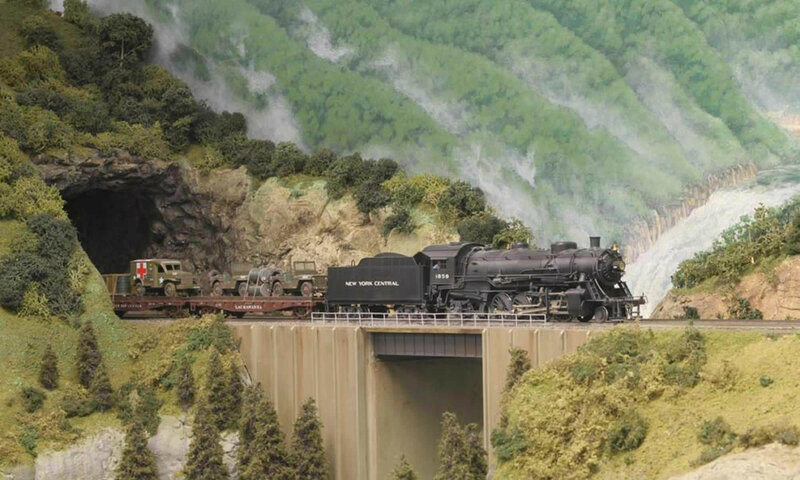 There is also a Yahoo “S-scale” e-group (as well as this S Scale SIG) that provides on-line opportunities for S modelers to seek out specific out-of-production models from other e-group members who might be willing to thin out their stashes. Those who know me know that I do not model the NYC per se. The reason is that I could never hope to do justice to the sprawling Central in a 12 x 39 space. Instead, I model a freelanced Northeastern road over which the NYC has trackage rights. As such, my railroad hosts several NYC System steam locos: four J-3a Hudsons (fig. 1, fig. 2, fig. 3), an S-1b Niagara (fig. 4), H-6 and H-10a Mikados (fig. 5, fig. 6), an L-2c Mohawk, and a P&LE U 3k switcher. All but the Mohawk and U-3k are/were commercial offerings, although the latter, a USRA 0-8-0, was also available as a brass import. In addition, L-3 and L-4 Mohawks (fig. 7, fig. 8) and a CR&I B-62 0-6-0 were produced as brass imports. My off-the-shelf NYC diesels include two Baldwin “sharks” (fig. 9), two RS-1 road switchers, and an Alco FA/FB-2 set, all from kits (fig. 10, fig. 11, fig. 12); an E-7A (fig. 13), RS-3 and EMC FT A/B (fig. 14), all brass imports; and a plastic ready-to-run EMD SW-9 (fig. 15). Other ready-to-run NYC diesels have been manufactured, including Alco PA/PB-1 and PA/PB-2, F3 and F7 A/B sets, GP-9, RS-3, Baldwin S-12, and U25B. There have also been brass EMD E-8 A/B, RF-16 Sharks, Alco RS-3, and kits for several Alco and EMD switchers (fig. 16). I have scratch-built only one NYC diesel – a class DEf Alco/GE boxcab 2-D-2. One NYC gas-electric, a Brill unit, was produced as a kit by Dayton Model Products some 60 years ago (fig. 17). There have thus far been no NYC/CUT electric locos produced in S scale. The accompanying table lists the facts for all the commercially-produced NYC model locomotives. Of the steamers listed, only two came as non-specific for NYC: The 0-8-0 and the H-6 Mike, both USRA locos and both Overland Models imports. The switcher requires nothing but paint and lettering to turn it into a NYC loco. The Mike requires only a hot electric soldering gun (no solder necessary!) to raise its laid-flat whistle to a vertical position, plus paint and lettering. Lettering sets can be a problem for Overland’s brass S steam locos, none of which came painted. The best source currently is C-D-S, a Canadian firm that sells dry-transfer lettering. C-D-S no longer produces any dry transfer sets, but some are still available from existing stock. River Raisin and SouthWind brass imports were available painted and lettered. Diesel modelers have it much easier. Decals for lettering and striping NYC EMD and Alco units are available from Des Plaines Hobbies/S Scale America. All the diesels from American Models and S Helper Service are/were available painted and lettered for the NYC except the U25B (U25B decorated units ironically do not include NYC, the largest customer for this locomotive). River Raisin’s brass Baldwin RF-16 also came painted and lettered. A chart detailing the NYC locomotives manufactured over the years accompanies this article. S scale NYC passenger fans have mixed blessings. Many heavyweights specific to the Central have appeared over the years. SouthWind Models imported brass models of a whole train of NYC heavyweights, from head-end cars to observation cars (fig. 18, fig. 19, fig. 20, fig. 21). However, only two are currently available, ready-to-run 70-foot baggage and 70-foot postal cars in two-tone grey from American Models AM). Also from AM is a 70-foot CNJ-prototype single-window coach and matching observation car that can pass for NYC. AM offers these cars in Pullman green with black roof, unlettered for those who are willing to do their own lettering. Decals for these are available from Des Plaines Hobbies. Recently, American Models re-released its 80-foot 12-1 and 10-1-2 Pullman sleepers in the two-tone grey Pullman pool scheme, but these are sold out. Some may still be found at retailers and online. Prospects are much better for streamliner enthusiasts who don’t mind doing their own kit-building, painting, and lettering. The Supply Car provides universal kits that include core bodies, underbody and roof details, and sides for any car built by ACF, Budd, and Pullman. Many hundreds are in the catalog listing. Others not in the catalog can be produced as long as a plan exists, as in the series of Pullman plan books by Randall and Ross. The sides are custom laser-cut for each order. American Models currently produces ready-to-run 74-foot versions of the NYC 1941 Empire State Express Budd cars, including the mail car, diner, coach in several car names), and observation car. For the fastidious NYC modeler, the RPO is short by two blank panels (one on each end); the diner is short one table-setting window, the coach is short by one large window (two double seats). The observation car’s door and window arrangement is correct, but crowded together to fit in the shortened length. Long before any of these hit the market, Chester Industrial Arts and Midgauge Models (name later changed to Sylvania Models) produced rather elementary kits for several styles of Pullman-prototype fluted (Chester) and smooth-side (Midgauge) passenger cars (fig. 22, fig. 23). In the same time frame (1950s), Super Scale Models manufactured rather well-detailed copper and brass kits for several heavyweights, including NYC 60-foot baggage and RPO cars and 12- and 14-section Pullmans. Nixon Models (Nimco) produced somewhat less detailed heavyweight coach kits (fig. 24). Models by Miller joined the fray in 1961 with photoengraved brass kits for several Pullman-Standard heavyweights (fig. 25). A chart detailing the NYC passenger cars manufactured over the years appears at the end of this article. It’s difficult to list NYC freight cars because so many non-NYC freight cars bearing NYC livery have been manufactured. An excellent example was Pacific Rail Shops’ beautiful 40’ steel MDT reefer kit finished in white with red and blue stripes. However, this kit was a PFE prototype with 3-3 Dreadnaught ends. Even so, I could not resist purchasing and building six of these. There are some NYC-specific freight cars. Funaro and Camerlengo markets resin NYC gondola and covered hopper car kits. Pacific Rail Shops (now S Scale America) has NYC and P&LE 1937 AAR 40-foot boxcars. Locomotive Workshop used to produce a kit of questionable quality for an unpainted boxcar that was correct for the Pacemaker 174000-series cars. Kaslo Shops* currently manufactures a fine kit for the 40-foot PS-1 boxcar. American Models produces ready-to-run USRA-style (three feet longer than the USRA design) vertical-ribbed two-bay hopper cars in both red and black NYC livery. A beautiful ready-to-run USRA composite drop-bottom gondola is currently available from S Scale America (fig. 26). S Helper Service (now MTH) produced accurate USRA hopper cars, in addition to USRA panel-side rebuilds and PS-2 two- and three-bay covered hopper cars. Other NYC-specific freight cars have recently included USRA single- and double-sheathed boxcars from S Helper Service, and a basswood kit for a NYC 65-foot mill gondola kit in the 1960s from Regal Kits (fig. 27). 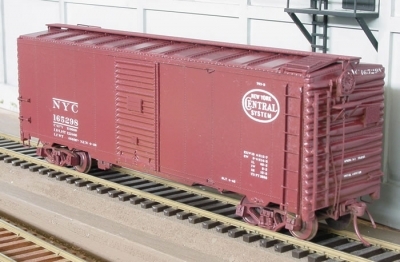 Standard Railway Casting Co., operated by Earl Tuson when he’s not farming, produces kits for highly-detailed prototype-specific house cars, one of which is a beautiful 40-foot NYC boxcar (fig. 28). For NYC caboose fans, Kaslo Shops* currently markets a resin kit for the 19000-series wood-sheathed caboose. Models of the shorter 17000-series cabooses can easily be kitbashed from these. G&W Models imported a brass 19000-series caboose many years ago (fig. 29). River Raisin models more recently imported a brass 20200-series bay-window caboose (fig. 30). *Kaslo Shops (and perhaps others) does not always have S products in stock. When enough orders pile up, the owner makes another production run. However, S retail outlets (e.g., Hoquat Hobbies [USA] and Central Hobbies [Canada]) may have stock on hand even when Kaslo doesn’t.